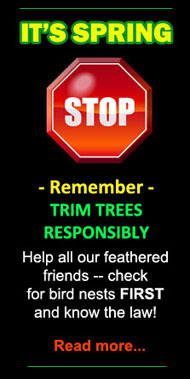 The plight of the parrot is well known and widely regarded as one of the most pressing conservation issues of our time. 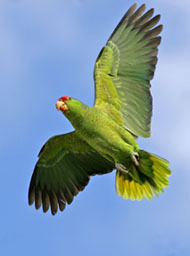 With numbers decreasing at alarming rates, wildlife organizations worldwide have struggled to save parrots' natural habitats and do eveything possible to stop the importation of wild-caught parrots all over the world. While this struggle continues, thousands of miles away from their native land, in a most unlikely place, some species of parrots have (not so quietly) made their presence known. Rumor has it that decades ago, an exotic bird smuggling ring was surprised and just as the authorities were ready to pounce, the wild-caught birds were freed. Another rumor speaks of firefighters responding to a call in a pet shop and rather than see the birds perish, the firefighters set them free. Though Urban Legends have circulated for more than 30 years, there are some that believe the wild parrots may have come here on their own through normal exploration. Others believe they are all escaped pets. Not true! The wild parrots flying free in Southern California today are descendants of wild-caught parrots who were imported into the United States before importation was banned and somehow either escaped or were released intentionally. These birds were already well versed in their survival skills and able to establish themselves in areas where exotic plant-life is plentiful. Contrary to popular belief, companion parrots stand very little chance of making it out there. Though some have made it, it is a very small percentage. Without the expert training that adult parrots instill in their young, the odds are against them from the beginning. 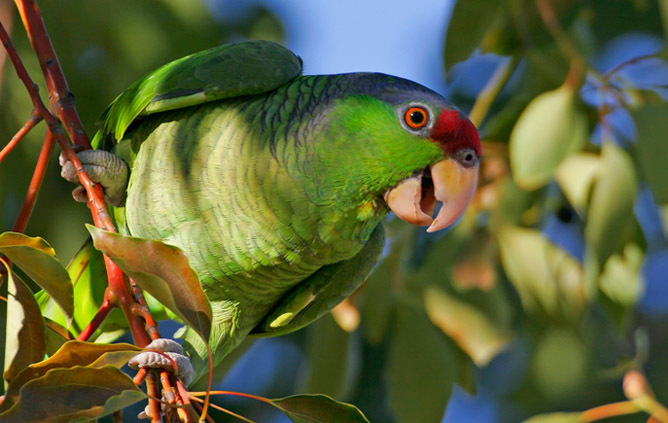 Wild parrots have been documented in Southern California since the 1960s and there is strong evidence to suggest there may have been wild parrots as far back as the 1940s. One thing is certain -- several events have contributed to the status and distribution of wild parrots in California today. With their personal origins a mystery, these naturalized psittacines have banded together to make the skies over Southern California their flyways, the wires their playgrounds and the trees their homes. Steadily increasing in numbers with the passing of each spring, the successful adaptation to the urban environment by these pioneering parrots gives testimony to a promising future. Join us in an up-close and personal look at their lives, only at californiaparrots.us. Many parrot species, in their natural habitat, are gravely endangered due to the pet trade, habitat loss and other variables. The naturalization of parrots in California, Florida and Texas has shown there is hope that these incredible birds can survive among us. It is with this hope for the future that we ask you not disturb, disrupt, harrass or attempt to capture these free-flying parrots. Parrots mate for life and have deep emotional ties to their flock members. They would suffer greatly if not left to do what parrots do. There are several flocks (large and small) of wild parrots throughout California and most people consider them enjoyable to have around. These birds, as all wildlife, greatly deserve our respect and protection. With sincere gratitude, we thank you for caring and for your continued cooperation. Do you have wild parrots in your neighborhood or see them in specific locations? Have you noticed flocks flying in a certain direction? We'd like to hear from you!! 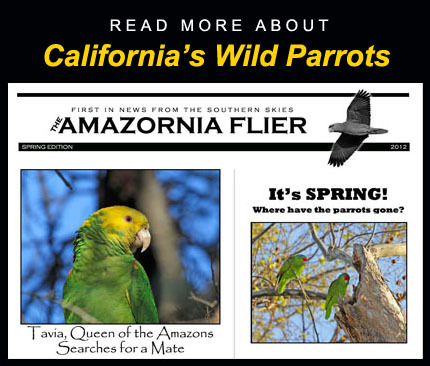 Amazornia.us, in cooperation with the California Parrot Project, continues to actively research and document the wild parrots of Southern California. We rely on public participation to assist in our research. Please take a few short minutes to report sightings with our easy to use online form. With sincere appreciation -- we thank you! JOIN THE FIGHT AGAINST WEST NILE VIRUS!!! ATTENTION VIEWERS -- West Nile Virus is here to stay!! Please help protect yourself, your family, your community and our natural world -- report all mosquito activity and deceased birds to your local health authorities. Don't delay! Remember, while we humans have some measures of protection, the only help our natural world has is YOU! For more information on West Nile Virus and how you can help, visit the Center for Disease Control’s website at http://www.cdc.gov. California residents may also want to visit the State of California's West Nile Virus website at http://westnile.ca.gov. To our out-of-state visitors, please contact your local health authorities for more information on how you can help in your area. may be used in any fashion without the express written consent of the artist.